The New England Patriots headed into Minnesota last night for a Monday Night Football matchup against the Vikings. This was supposed to be a tough battle and plenty of people were even picking the surprising Vikings to topple the Pats. But Tom Brady and company picked apart the Viking defense for one of his best games ever, while the Patriots defense just smothered the Vikings, whose only score came on a punt return. The Pats totally dominated this game and looked as good as they ever have. The final score was 31 to 7 and it didn't feel that close. This group of "no-name" receivers is suddenly looking good enough to go all the way to another Super Bowl. I'm already drooling over the next game, Sunday night against Peyton Manning and the Colts - hope we get some early snow at Gillette Stadium this year. 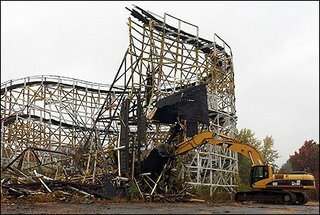 Whalom Park, a small 100 year old amusement park in Lunenburg Ma had its greatest monument, The Flying Comet roller coaster, torn down this week. Though the park has been closed for a few years already, this is finally the closing chapter. Here's a good story in the Boston Globe on it. I grew up just a few blocks from Whalom Park in a little section of Leominster called Whalom District and spent many weekends playing skeeball with my dad and going on the roller coaster and Pirates Den over and over as a kid. Each year I looked forward to opening day, that was always Easter weekend and featured hidden egg hunts throughout the park. As I got older, me and my friends had huge collections of string and metal tags that served as the all-day entrance to the park. We would scour the parking lots for discarded tags and ask people leaving the park each day for their bracelets for our collections. If a week went by without me running around Whalom, we must have been out of town. As I got older still it became the site of my first job too. Because it was a service industry you could work the concessions and weekend picnic area at age 13 or 14. That's when I learned never to eat at parks. The park was the locale of my first adventures being drunk, meeting girls, getting in fights... all the low-end traditions of growing up in central mass. Combined with the nearby Video World arcade and the drive-in --- all the best trappings of a misspent youth were available. I finally grew out of the place before I was old enough to be a ride operator - one of my dream jobs while a tyke. I also remember seeing the flames in the sky when a big fire hit the outing and storage area in the early 80s. Though I was in high school then and now cynical about what a lame boring park it was, that fire was a very sad thing to see. From the roller rink, miniature golf, bumper cars, fun house (which seemed to always be blasting Boston or Van Halen), giant slide, turnpike, girls, arcade, beers... man I forgot how much fun I had at Whalom Park. We saw "The Departed" last night - the Martin Scorsese Irish mob movie set in Boston. It had been getting some rave reviews and the city was buzzing when the production was in town months ago. I was really looking forward to it, so I was surprised how hard it was for me to get into at first. Between the Scorsese staples of a mobster voice over, tracking shots and Rolling Stones "Gimme Shelter" soundtrack - I felt like I was watching somebody rip off a Scorsese movie. I was also initially distracted by all the "local boys" - Matt Damon, Mark Wahlberg; as well as the non-locals doing their best Bahston accents. But the complicated, layered plot and performances quickly pulled me in. This is Leonardo DiCaprio's best performance as far as I'm concerned - he doesn't seem like a kid anymore. The cast is full of great performances from Damon, Wahlberg, Alec Baldwin, Martin Sheen, and of course Jack Nicholson. This is a remake of "Infernal Affairs", a 2002 Hong Kong flick that pits a mob informant working in the police against a cop undercover in the mob. The stakes are constantly raised and deciding who is really a good guy or bad guy is a whole lot of fun. The script crackles with some great dialogue. A very enjoyable film that I look forward to viewing again. Lori got the big news this weekend - she's been accepted to run for the Dana-Farber Cancer Institute in the Boston Marathon on April 16, 2007. She is very excited about this - as am I (but thankfully I don't have to run!). Now the fundraising campaign kicks off. You can visit Lori's personal web page and help in her efforts to support Dana-Farber Cancer Institute and The Jimmy Fund.